If you’re anything like me, you typically meditate in a special place in your home. If you have the space, you might have an altar or other sacred spot that you retreat to daily. Or maybe you have a favorite meditation pillow and like to light a candle or incense to set a relaxing mood. Whatever your meditation ritual, that’s a beautiful thing. But as much as I love my pillow, the truth is that it’s not always necessary for a great meditation. You can meditate just about anywhere — from your couch, your office (with the door closed), your porch. Sometimes you don’t even need to close your eyes. 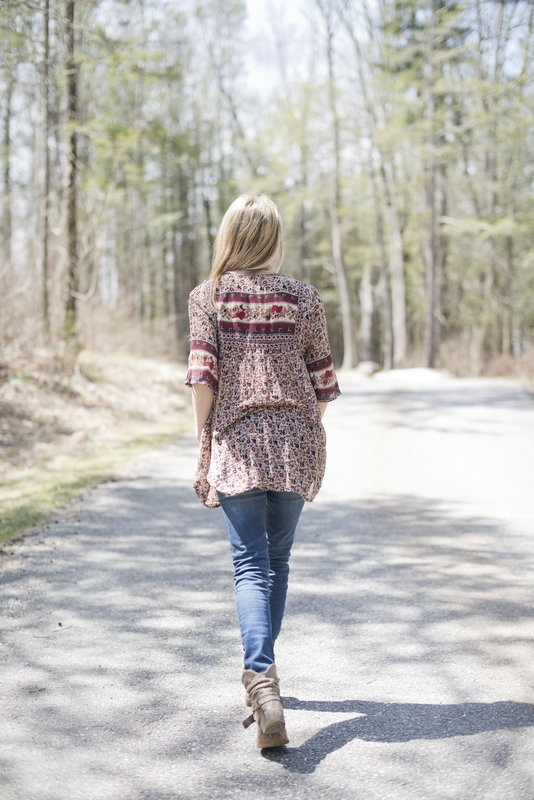 You can meditate while walking! I want to share with you a joyful walking meditation that you can do while strolling around the neighborhood or through the woods. Wherever you can walk is totally fine, whether it’s a busy sidewalk or a quiet meadow. Just be sure wear comfy shoes and keep your eyes wide open so you’re aware of your surroundings while your earbuds are in. Lace up your shoes, press play and let serenity set in. After your walk, comment below and let me know about your experience. I hope this meditation serves you. I want to make meditation really easy and fun for you! So I created a free 4-track album of guided meditations. There are meditations for different areas of your life. They’ll help you de-stress, get energized, attract your desires and strengthen your body image. Get instant access here! love this! love you! perfect for the first day of spring! Another blessed walking meditation includes labyrinths (walking on a labyrinth path as meditation). Find out if your city has any public or private labyrinths, for you to visit. It is well worth the research/visit. Also the ‘path of the writeous’ offers an interesting “meditation 2.0”, integrating labyrinths, poetic affirmations and cannabis. This is Gabby at her most brilliant as far as I’m concerned. Thank you Gabby. Stay blessed and keep inspiring us. I do lots of walking each day for exercise. I never thought of combining this with meditation. Lovely accompaniment for my walks along the beach. Thanks for the new experience. Thank you Gabby! Have not been on for awhile – nice to know you are always here to make a positive difference in my life! I have a quarter mile walking path around my property and will start using this meditation when I walk at least once a week. Spring weather here in West Chester, PA! Thank you Gabby! Beautiful meditation! Love it. I love your work and am proud to be a spirit junkie. I’m also a part time educator at Lululemon and just published a book titled Meditative Fitness: The Art and Practice of the Workout, about applying meditation to going to the gym and beyond. This hits home because I have some walking meditation in there and a lot about active physical meditation. I would love to share it with you and send you a copy. You’ve been an inspiration ever since I saw you on Super Soul Sunday, and basically everything you produce helps give me the courage to keep going on my journey. Lots of love and many blessings! I’m taking this on my lunch break with me right now, I need to get out of the office and get some fresh air and light. Thanks Gabby! Hi Gabby, what a great way to meditate. As a mom, and a lover of walking, often my peace and quite moments are walking with a baby in my carrier or in a stroller. The special place and time at home for meditation is pretty much non-existent. So I am looking forward to integrate this meditation into the walking in the park routine. Especially when baby is an a carrier and snoozes off. Thank you for your wonderful guidance! Love the music. Who is it by?